Welcome to Tartu Ashtanga Yoga School! Please feel free to join our classes, see the info below and don’t hesitate to contact us for any questions. If needed, the administrator will guide you to our school. Please call +372 52 53203 for any questions. Tartu Ashtanga school offers traditional ashtanga vinyasa yoga self-practice (Mysore style) and led-classes. Check out your schedule (Tunniplaan) for available classes, please see the descriptions below for understanding our schedule (it is only in Estonian at the moment). 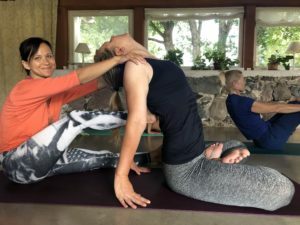 Mysore style is a specific way of teaching ashtanga vinyasa yoga in a self-practice setting by the methods of Sri K. Patthabi Jois, who created the Ashtanga Research Institute in Mysore, India. Mysore is not a led class. Every student practices in their own rhythm up to their last asana that the teacher has given them. You are welcome to join this class once you have memorized the sequence (good enough, you don’t have to remember everything, the teacher is there to help you) and are able to use the correct ujjayi breathing technique. *Last sitting pose is Janu Sirsasana A. The class lasts ca 60 min and is suitable for beginners or is a great start after a longer break from your yoga practice. ** Last sitting pose is Navasana. The class lasts ca 75 min and is suitable for students who already know the practice. At the moment there are no extra classes for beginners. You are welcome to join our other classes, e.g. led class (juhendatud tund).